Katie was speaking of in-class assessments and formative data and MTSS structures and stuff like that. The stuff that plays into what a lot of people are lamenting about the modern state of education. Education is currently a world of standards, learning targets, data goals, and accountability. I think those are good things. I think that schools should be expected to do a good job growing every single kid in their school. And if they are doing a good job for every kid, they shouldn’t be offended by being asked to prove it. And if they can’t prove it (either because they aren’t keeping track, or because they aren’t doing a good job growing each kid), we shouldn’t be okay with that. But, we can’t lose sight of what drives change. The ultimate goal is for all students to achieve at a high level. Not simply to do their best, but to change their best and then do the brand new best. And in order to do that, it should be a foregone conclusion that we need the students to come to school. Everyday. All year. Every year. And not simply because the law makes them. Side note: the data on the negative effects of dropping out are intense and not in dispute and yet, in light of that, many kids see it as a reasonable choice compared to coming to school. So, it should satisfy NO ONE that we have to require kids by law to come to our classrooms. Why aren’t they flocking to them by choice? … it seemed to often come with a corresponding reduction in the stuff that makes the classroom environment enjoyable. And the concern over that isn’t simply fluffy “kids-should-be-kids, shouldn’t children be happy?” stuff. Not at all. It’s economic. We need those young people to come to school. Enthusiastically, if possible, so that our systems can help them grow. If the learning environment is regularly uninspiring, then we are going to lose our target audience. And everyone loses if that happens. So, what to do? Well, perhaps we could consider designing academically-meaningful tasks that were also enjoyable. Tools like Desmos, Formative and EdPuzzle (among others) help a lot in creating flexibility in lesson design that can bring a variety of potentially enjoyable elements into core activities. But beyond that, take a look at the two pictures above at the top of this post. Here, I’ll show you one more. Some of those are a bit of a stretch, but you get the idea. Strategic play time isn’t “just” play time. Just like maker space time isn’t “just” maker space time. These environments can be built to create academically supportive learning experiences. Notice: “can be built”… it requires strategic design to make it valuable. So, here are some thoughts I have about how to take “just” play time and make it meaningful. Have a goal for your students during your play/maker time. What type of learning are you trying to get? Do you want the students to collaborate? Communicate? What do you expect that to look like in this type of setting? How do you intend to communicate those expectations to your students? Take data during the play time. The students are playing. You are not. Your job is to figure out if this thing is working toward your goal. So, decide what data you are going to take. Take it. And monitor their progress. Remember, data isn’t always quantitative. Have the students reflect a bit. Having a bit off a “show-off something cool” time will give the groups a chance to describe to the class what they made, tell a story about it, and gather ideas for next time while listening to the others. Rushton Hurley says “it isn’t our job to entertain the kids, but if we do our jobs in an entertaining way, then they are much more likely to come along for the ride.” I endorse that message, because them coming along for the ride is exactly what we need them to do. Remember, if we are going to grow them, we need them to be in school. Everyday. All year. Every year. Let’s start thinking about creating the kinds of environments where a young person would voluntarily do that. I’ve written about the connections in math and art before. The visual nature of Geometry lends itself quite nicely to this. I found that the right pairing could bring in the engagement of the visual arts while maintaining fidelity to the content. Exhibit A: Sarah Laurens, 5th grade teacher at North Elementary in Lansing. Mrs. Laurens reached out to me excitedly while I was in her building to see a math activity that she was leading her students through. They involved quilts hand sewn by Sarah’s grandma. 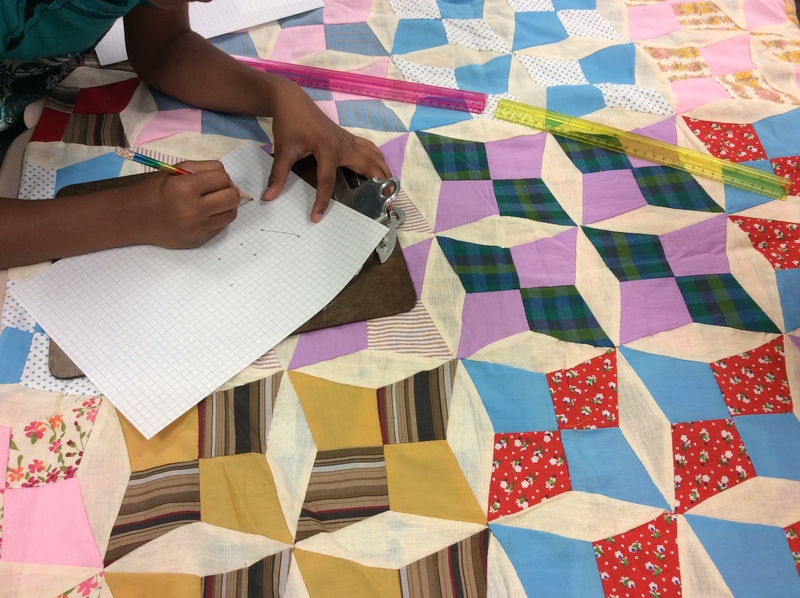 The activity went like this: Students were in groups of threes and fours gathered around one of grandma’s quilts. 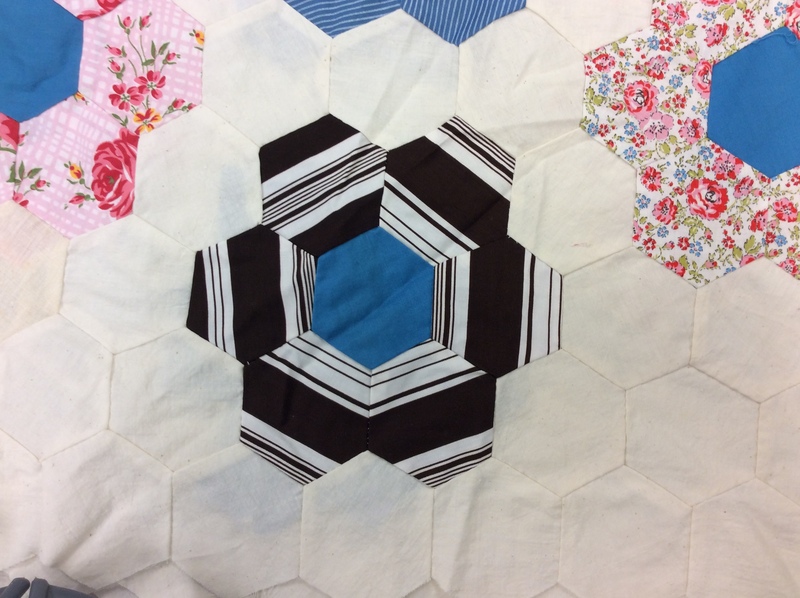 Each quilt was made of a series of geometric shapes. 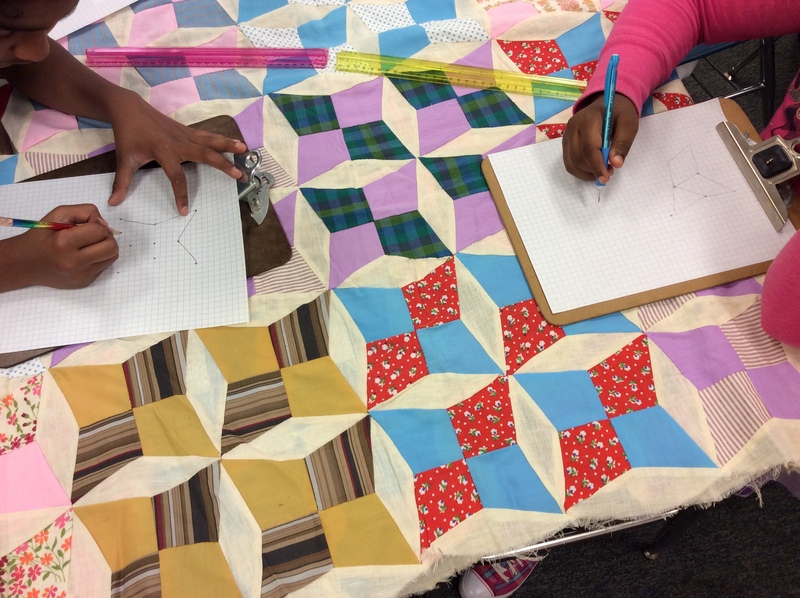 Sketch the primary “unit” shape of each quilt and identify each of the polygons that are contained within it. On the surface, it is a fairly simple activity, but listening to the students talk to each other. 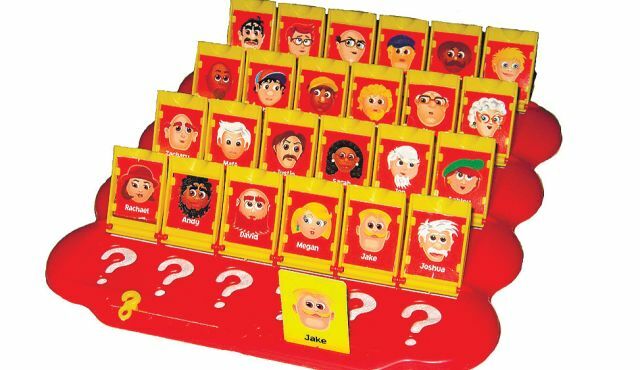 Student 1: “One… t, th, f… oh! five…. They’re pentagons! Interesting images like these were leading to some interesting conversations as well. I’m thinking of a conversation I heard between two students who were trying to make sense of the shapes they were in the picture directly above to the right. They were trying to to determine if the purple section in the middle was one big shape or two smaller shapes put back-to-back. Then after some discussion, they realized that their answer would be the same either way. (Quadrilateral was their choice for the shape name. The word “trapezoid” was getting thrown around, but the students were having to be prompted for it). I very much enjoyed getting to see these fifth graders exploring. Ms. Laurens was excited, the students were engaged (and this was clearly not the first time they were expected to be a self-directed and collaborative). I’m just bummed that my schedule forced me out the door before I got to see Ms. Laurens’ closure of the activity. The students were wrapping up their discussions as I had to head out the door. I always found it tricky to get students up and out of their seats meaningfully. I know that cooperative learning manuals are full of ways to get students meandering around the classroom, but I always liked to try to make sure that the movement was meaningful as a tool to help them learn the content. In the past week, I’ve seen two examples of meaningful active learning in the realm of Geometry. And as it happens, both are from my neck of the world. One comes from Tara Maynard who teaches middle schoolers in Zeeland. Her post on “Dance, Dance, Transversal” plays off the mechanics of Dance, Dance Revolution while putting the students in an experience of having to know the different angle pairs coming out of parallel lines cut by a transversal. The thing I like about this is that in the end, this is a vocabulary exercise, but Tara has found a way to use movement and activity to add some life to it in a way that fits pretty naturally. This is a nice pairing. And, as she states in her post about the activity, she pairs the students up so that one can watch the feet of the other to make sure they aren’t making mistakes and reinforcing poor understanding. She also includes the file so that your students can play, too! The other comes from a pre-service teacher at Central Michigan University. 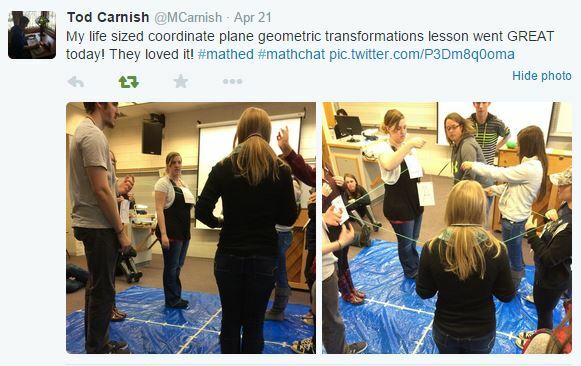 Tod Carnish used Twitter to share a nice idea to help students explore geometric transformations. And as much as it hurts for me to say nice things about Central folk (Go Broncos! #RowTheBoat), this seems like a pretty solid idea. Sticking to the idea that transformations are really just the organized movement of vertices, why not have those movements represented with the students acting as the vertices? Think of the ways that one could use this as an introduction to function notation of the transformations? 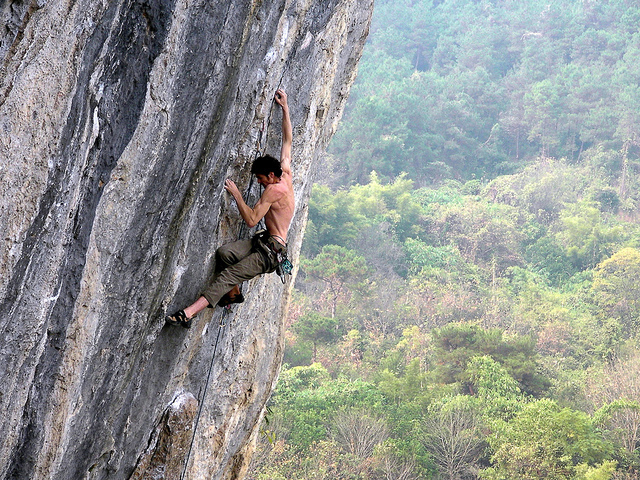 Characterizing the movement by it’s vertical and horizontal components? Nice thing about these two fine educators is that they love to share. If you have questions about their work, or want to drop them some props, I’m sure they’d love to hear from you! 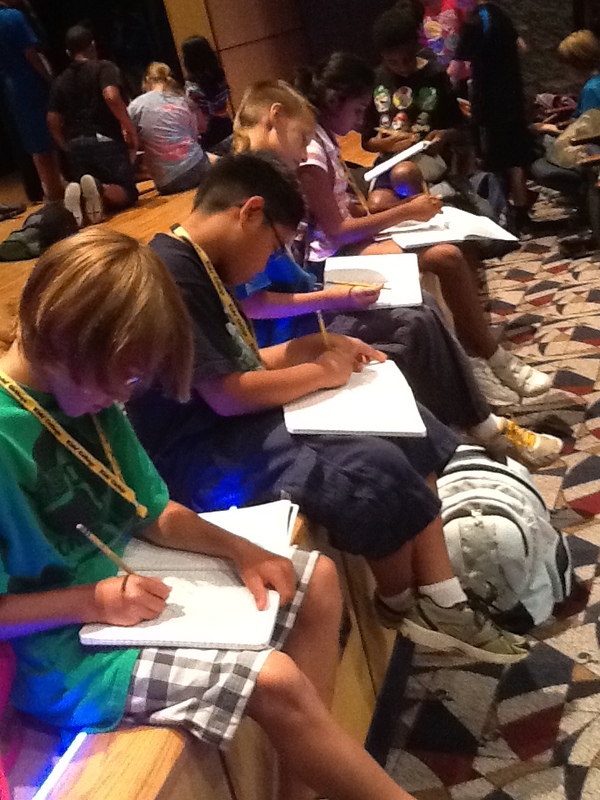 What could make a bunch of 10-year-olds do this in July? Today was the opening day of Kids’ College, which is a two-week, half-day science academy for going-to-be 5th and 6th graders at Michigan State University. This is my fifth year getting to lead as an instructor. That makes this my fifth opening day. Today I was struck by some observations that I hadn’t noticed before. First, I’ll set up the situation. After an auditorium-style presentation with the whole group (there’s 18 instructors each with a group like mine) getting through the get-to-know-you info (lasting about an hour), we split up into individual groups. This year, I am leading 10 young people. I’ve never met any of them. Only two of them have met someone else in the group. 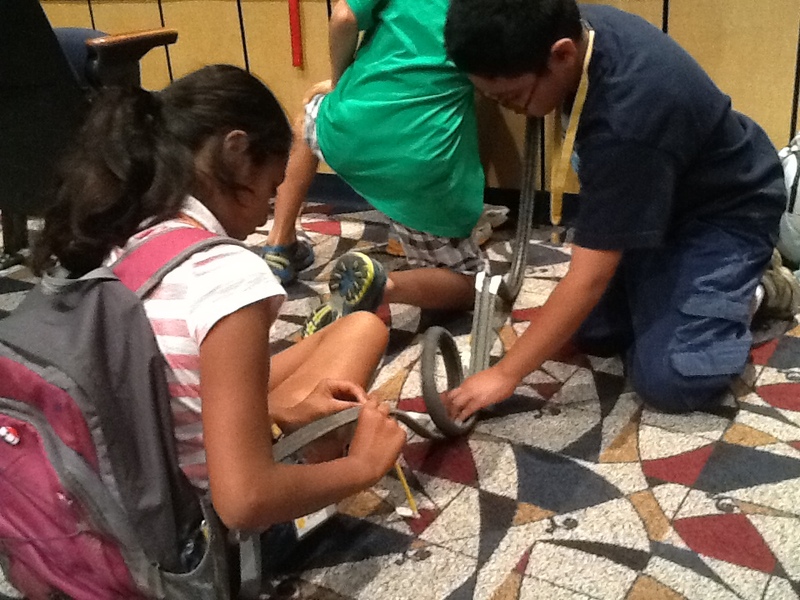 After some introductions, we have about 75 minutes to use pipe insulation, tape, a marble, and anything else at arm’s reach to build a roller coaster that met some basic common guidelines. It is of note (at least to me) that I wasn’t going to collect anything, I wasn’t going to record any grades, truth-be-told I wasn’t going to hold them accountable at all. So, here we go. It wasn’t quite right, so they fixed it. I didn’t have to tell them. Observation #1: Off-task behavior was shockingly absent. 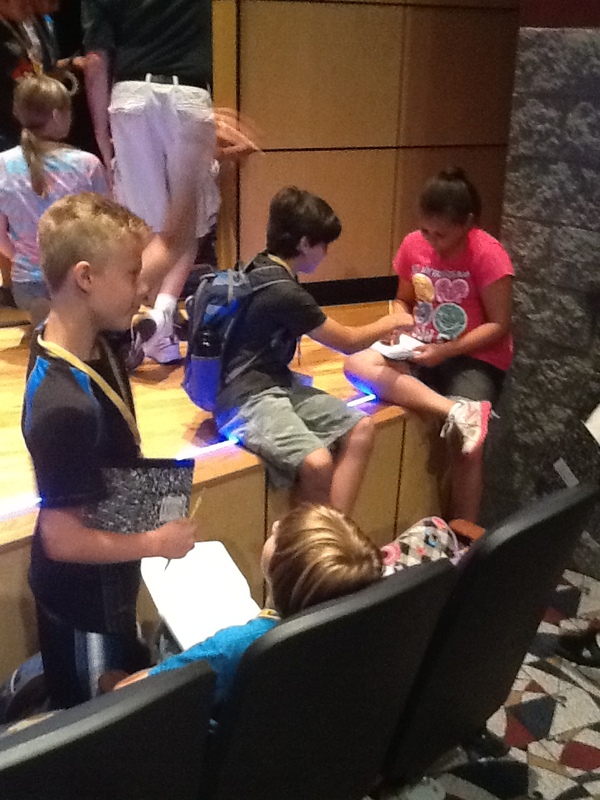 These kids had ideas, discussed them, and designed, reality-checked, and made predictions. I told them that I wasn’t handing them a marble until the coaster was built, stable, and ready for testing. My favorite question became “If this coaster has trouble, where do you think the trouble-spots will be?” Both teams had talked about it already. They knew. And they were both right, by the way. Also, no bathroom breaks. No kids asking to stop to eat their snacks. No kids asking what time it is and how much longer we have until we are done. I mean that. None. There was no grade on the line. He simply didn’t quit trying. This team discussed, sketched, delegated without much direction. “Yeah, but these are learners who are interested in science.” Okay, perhaps, but that doesn’t explain the group dynamics. Besides, putting these kids back on the busses to go back to meet their parents was all it took to reveal to all of use that these were definitely normal 10-year-olds. “You’ve done this activity before and it doesn’t always go this well.” Very true. I have had students in the past that are a bit tougher to motivate. I have had groups with super-dominant leaders who try to monopolize everything. (In fact, this year, I tried to get around that by adding the structured timing… first 10 minutes discussion/sketching… then no marble until the whole design is constructed.) I suppose the student selection forces-that-be may have blessed me with a good mix, but I can’t help but feel like there is something more at work here. I mean, believe me, I understand the role of assessments and obviously I have a situation where I’m not being held accountable much either, which gives me a lot more flexibility. But what if that is the key? What if all the off-task behavior that is getting in the way is being caused by grades, tests, and other stuff? What if I got a window into authentic learning? What if today I saw a formula that worked? How can I integrate the lessons that I learned today into the September-to-June environment? All I know is that today I saw something work. I want my classroom to work like that. I don’t know. I guess I have more questions than answers. Perhaps that is why I am asking the questions to all of you. I know that you have more answers than me. I look forward to your perspective.